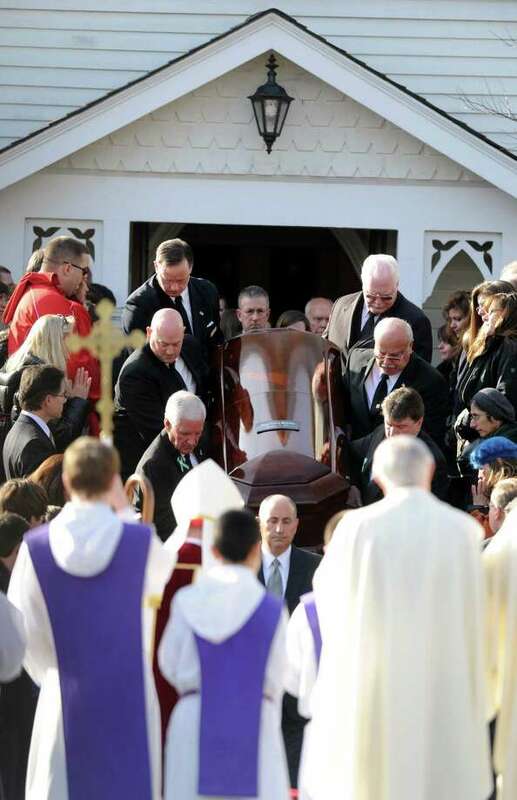 KATONAH, N.Y. -- With New York Cardinal Timothy Dolan leading the way, the tearful, quaking family and hometown of Anne Marie McGowan Murphy bid a wrenching farewell Thursday to the slain 52-year-old special education teacher who died at Sandy Hook Elementary School in Newtown last Friday trying to protect 6-year-old Dylan Hockley from gunfire. Dolan underscored her sacrifice. "Like Jesus, Annie laid down her life for her friends. Like Jesus, Annie's life and death brings light, truth, goodness and love to a world often shrouded in darkness, evil, selfishness and death," the cardinal said. Murphy's husband, Michael, told the couple's four adult children and a standing-room-only congregation in St. Mary of the Assumption Church that his wife of 30 years had been true to herself in trying to defend the defenseless. Dylan and the 19 other 6- and 7-year-olds who died at the hands Adam Lanza did not die alone, her grieving husband told about 300 people packed into the white clapboard church in the center of this New York City bedroom community. She was there with them, he emphasized. Murphy was one of six teachers and 20 first-graders murdered when the heavily armed gunman broke into the Sandy Hook Elementary School on Friday and started firing a semi-automatic assault weapon into screaming children. Police said Murphy's body was found shielding the special education student that she had worked with one-on-one. Murphy had lived in Sandy Hook for the past 14 years. Dolan, wearing the red cap and carrying the staff of his office, looked to soothe and inspire the red-eyed congregation, noting that Friday would be the shortest day of the year, with the longest night ahead -- before the dawn brings lengthening days of light. Murphy, the archbishop said, was in the light of heaven that awaited the Christian faithful. There were light-hearted moments, such as when Dolan noted that scores of McGowans were present. Anne Marie McGowan had attended local parochial schools before going on to Southern Connecticut State University for a master's degree in education. "Anyone here Irish?" Dolan asked. The congregation broke into laughter. Many mourners had spent the minutes before the service catching up on the comings and goings of various extended family members in a clan that brought far-flung cousins together for the first time in years. Mourners included staffers from the elementary school where Murphy died. A woman in her 40s, with a Sandy Hook elementary school staffer badge attached to her purse, told her teenage son and daughter the service had been harder than she expected. "I can't believe I will go to work and she won't be there," the woman said, bent in grief. "I saw her every day." Another mourner, whose wife was a distant cousin of Murphy, told a friend that the congregation should pray for the children left living by shooter Adam Lanza. The slain are "with Jesus," he said. "The children who are living and saw the shooting, they are the ones that need our prayers."